A new bill introduced in Washington will eliminate wholesale dealer licenses in the state within a two-year period. This decision comes after the Washington Department of Licensing (DOL) has received numerous complaints about companies and individuals licensed as wholesale dealers in the state being involved in various malpractices. The new bill takes effect on July 1, 2017, when the DOL will stop issuing Washington wholesale dealer licenses. Further provisions of the bill will come into effect in 2018 and 2019. For a full overview of the Bill’s provisions and what that means for current dealers, read on! Current requirements for obtaining a Washington wholesale dealer license have been rather low and simple. Unlike other dealers in the state, wholesale dealers did not need to have a physical location until recently. In 2016 an attempt was made to resolve the issue around wholesale dealers not having locations (and maybe never having visited the state), but the move was unsuccessful. As other dealers, though, wholesalers did need to have a Washington auto dealer bond. The DOL is currently still accepting license application. But with changes to the licensing process coming up soon, it has announced that wholesale licensing applications will not be accepted after May 15, 2017. Why is the Washington wholesale dealer license being removed? Numerous federal and state complaints have been issued that carriers of Washington wholesale dealer licenses have engaged in retail sales (something not allowed by that license), and in criminal activity. As a result, the state has now decided to phase out these licenses over the next two years. The DOL has also found that there were no serious economic benefits from the issuance of these licenses and that it has been difficult to receive compensation under the bond agreement of these dealers. So what are the provisions of the bill? House Bill 1722 eliminates the issuance of Washington wholesale dealer licenses as of July 1, 2017. As of July 1, 2018, the DOL will not be renewing old wholesale dealer licenses. 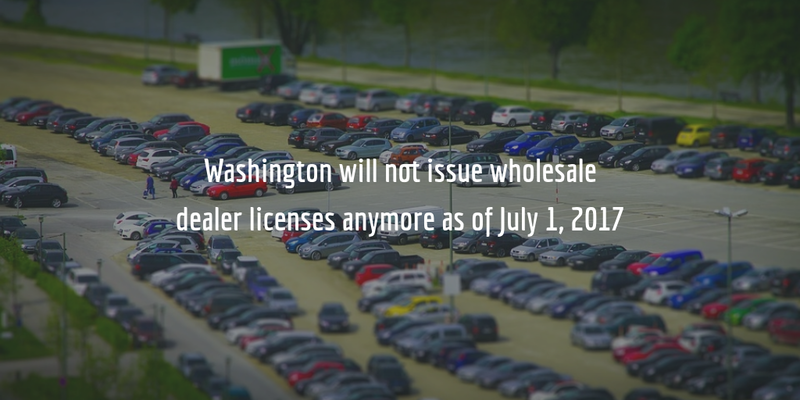 And as of July 1, 2019, the whole license category of wholesale dealers will be eliminated from Washington state laws. During this period, wholesale dealers will have the chance to transition to a retail vehicle dealer license. The bill also eliminates retail dealers’ right to institute action for recovery against a wholesale dealer’s bond if they have suffered damages or losses as a result of transacting with them. It remains to be seen whether this provision will cause difficulties or damages to any possible claimants. While the bill was backed by state representatives, it was opposed by a private organization, which saw the move as limiting and harmful to dealers. What are your thoughts on the change? Leave us a comment below, we want to get your feedback!